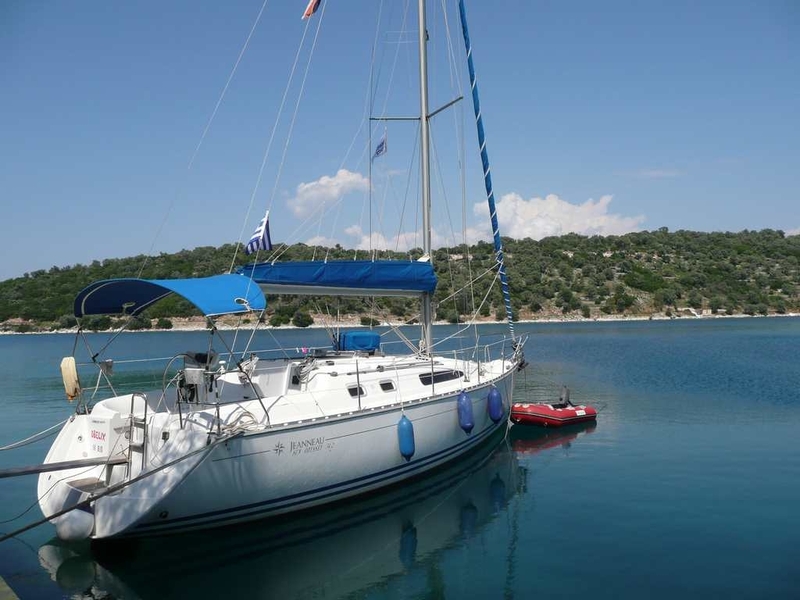 Why Choose a Kefalonia Flotilla ? The Zante route heads south, to Zakynthos and to the Peloponese coast, with the opportunity to visit ancient Olympia. The Kefalonia route takes us on a circumnavigation of the island, exploring Fiskardho, Assos to the west and Lixouri to the south before our beach party in a beautiful bay. Fly from UK to Kefalonia and transfer to Agia Eufimia harbour for embarkation. Our home in Agia Eufimia is a perfect point from which to explore the southern Ionian islands. (17 nm) Vathi is the largest town on the island, and is situated at the head of the well-protected bay. Explore the back streets for some great tavernas and nightlife. (15 nm) Lively and sophisticated but retaining some traditional Greek charm and character, a great place for people watching. (13 nm) Beach party today, and we head south to the west coast of Ithaca, and Poli Bay - perfect for a flotilla raft and a party on the beach. Plenty of choice - head south to Zakynthos, or alternatively head east to Ithaca, your lead crew will be happy to make some recommendations. Return to our base and enjoy a "last supper" together on the waters edge at one of our favourite tavernas in the Ionian. (15 nm) After the main briefing, we set sail for the harbour at Poros, to the south. After the punch party on the quay, a quick stroll into the town for a group meal all together. (23 nm) Time to cross the straight between Kefalonia and Zakynthos, and head to the capital of the island, well worth exploring as the sun sets. 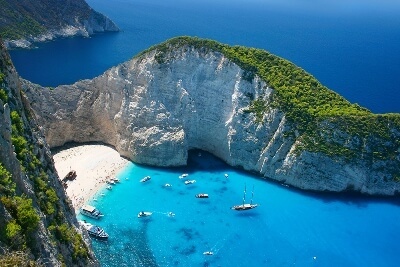 (13 nm) From Aghios Nikolaos, a high speed boat trip is possible to "Shipwreck bay", regarded as one of the best beaches in the world. Note: If weather conditions are not favourable, we substitute this stop for a beach BBQ and party in a secluded bay. 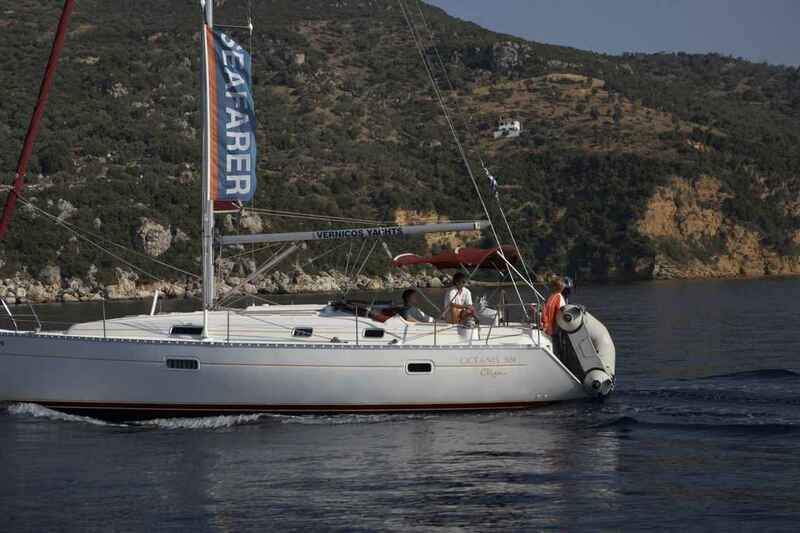 (28 nm) Sami is our destination today, heading back up to Kefalonia. The well protected harbour is right in the town, and some excellent fish tavernas beckon. Plenty of choices for your free sailing - head for the southern end of Ithaca and choose Vathi, or, weather permitting, head for the south facing bay of Lixouri and Argostoli. Return to our base and enjoy a "last supper" together on the waters edge. If you are leaving late, a trip to the caves is a great option. Fly from the UK to Kefalonia airport and transfer to our yacht at our base. Time to explore the town and enjoy a meal in one of the many traditional tavernas. Kefalonia flotilla holiday routes may vary during the season according to weather and operating conditions. Our flotilla crew will keep you fully briefed each day. As an independent company, we are able to keep our prices highly competitive – if you see a like for like product featured elsewhere cheaper, let us know and we will beat it! Your holiday with us is financially secure as we are ATOL licensed and your holiday is ATOL protected. We have been trading since 1995 so with over 20 years under our belts, you can book with total confidence. Direct road transfer to Aghia Eufimia in approximately 60 minutes to arrive for embarkation on our Kefalonia flotilla. On our Kefalonia flotilla, we circumnavigate this scenic island over a week, taking in Fiskardo, Assos, LIxouri and Spartia whilst on the other week, we head south to Poros and on to Aghios Nikolaos and Zakynthos Town on the island of Zante with the opportunity to explore East to the Peloponnese coast and onwards to Ithaka.